Home Fun Facts Krispy Kreme Nutella Doughnuts Exist and We’re Drooling! 2018 seems to be a good year for dessert lovers. First, there was the Kinder Bueno ice-cream. Now, there are Nutella doughnuts! What a time to be alive! Krispy Kreme is a well-known doughnut brand in the world, established since 1937. On 5th March 2018, Krispy Kreme made an announcement via Instagram that their Original Glazed doughnut comes with a little something extra. Imagine biting into an Original Glazed doughnut. Instead of the plain doughy texture, you feel something ooze out from it. A familiar taste, beloved by the world. The Original Glazed doughnut is now filled with Nutella! 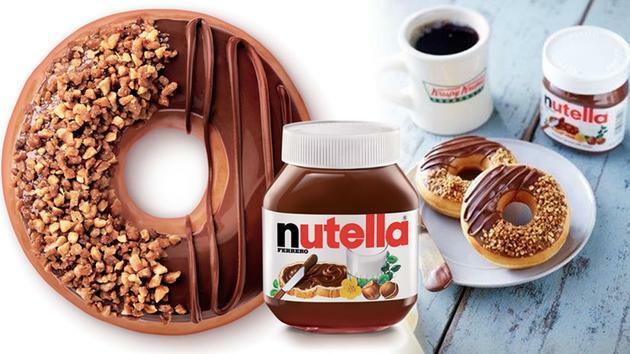 However, this isn’t the first time Krispy Kreme has incorporated Nutella into their doughnuts. Back in 2016, Krispy Kreme came up with the Nutty Cocoa Ring. The Nutty Cocoa Ring was a doughnut dipped in Nutella, topped with hazelnut pieces, and drizzled with chocolate icing. But a doughnut full of Nutella sounds much more enticing, don’t you think? This is the most important question of all, and unfortunately the answer is no. In fact, the Nutella doughnut can only be found in one place in the world. Dominican Republic is the lucky country who has sole possession of these wonderful doughnuts, and they don’t seem to be coming to Malaysia anytime soon. If you must have a bite, flying to the Dominican Republic is always an option, and you can enjoy the beaches while you’re at it! Or, you know, get some plain doughnuts and dip them into Nutella yourself!